Are you as happy as we are to see May roll into view?! It is really hard to believe that we are only 2 months away from the end of another school year. Looking outside at snow banks, it hardly seems possible. The 62nd PEI Home & School Federation Annual General Meeting was held on Saturday, April 11th, 2015. West Royalty Elementary had the largest representation at the meeting with 5 votes and 6 people attending so we received a gift card worth $100 to purchase bulbs from Veseys Seeds. These bulbs will be planted in the front garden of the school. For full details, including the Book of Reports and Resolutions, visit the PEI HSF Website at http://peihsf.ca/agm. The P.E.I. Home and School Federation will present two School Bus Driver Awards in June 2015. Parents/Guardians/School Staff, through their Home and School Associations, are invited to submit nominations for the 2015 School Bus Driver of the Year Award. Describe why you feel your bus driver deserves to be recognized. You may include support letters from other parents/guardians, school staff members and students in your school. The deadline for submissions is: Friday, May 15, 2015, 4:00 p.m.
Robin Williams once said, Spring is nature’s way of saying, "Let’s party!" So, we are going to do just that! With winter overstaying its welcome, the date for the Spring Fling has been postponed to Friday, May 29th from 5:30 - 7:30 pm. Hopefully Mother Nature will cooperate and melt all that snow so we can have a proper celebration of spring, with activities inside and outside the school. This will be a fun community event for the whole family. More details will follow soon but WE NEED YOUR HELP! We are short on volunteers for this event so if you are available and willing to help out, please let us know at westroyaltyhs@gmail.com! THANKS for the support! We welcome your input... any comments or concerns, please let us know. The P.E.I. 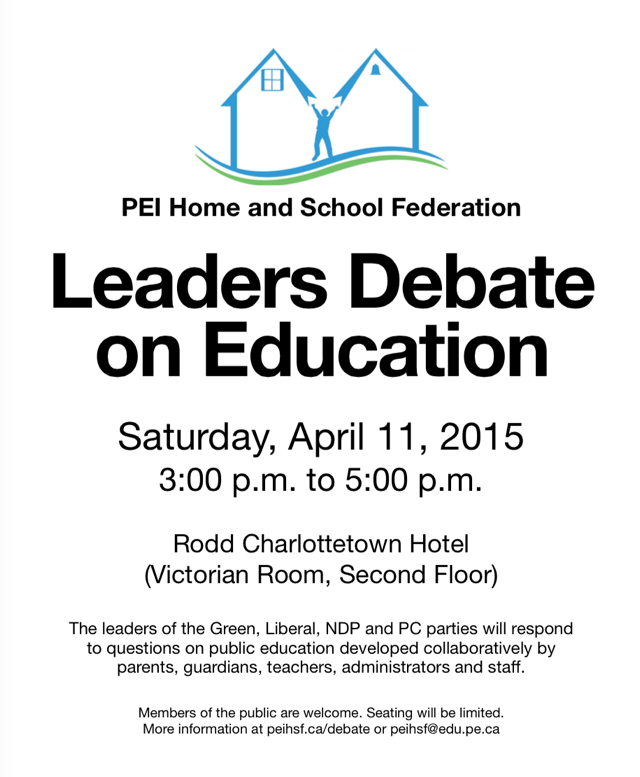 Home and School Federation will hold a Leaders Debate on Education on Saturday, April 11, from 3:00 p.m. to 5:00 p.m. in the Victorian Room at the Rodd Charlottetown Hotel, 75 Kent Street, Charlottetown. The leaders of the Green, Liberal, NDP and PC parties have confirmed their attendance. The debate, part of the Federation’s 62nd Annual General Meeting, will provide parents, guardians, teachers, administrators and staff with an opportunity to question the leaders on matters related to the public education system. The debate will be moderated by Marion Murphy, respected former teacher and former P.E.I. Home and School Federation President. Questions will be developed collaboratively by P.E.I. Home and School Federation members as part of the annual meeting. The public is invited to attend. Seating will be limited. Mark your calendars for Spring Fling - Saturday, April 25, 2015! This great event will be held at West Royalty School from 9:30 to 11:30 a.m. All students must be accompanied by an adult. The cost is $2 per person. Funds will go towards supporting the West Royalty Home and School. There will be bouncy castles, face painting and lots of other fun and games. More information will follow as the date approaches. Please note that tickets will not be sold at the door. Come out and enjoy; we look forward to seeing you there. The next meeting of the West Royalty Home & School Association is scheduled for Tuesday, April 14th at 6:30 pm in the staff lunch room. Everyone is welcome to attend! For minutes of our previous meetings, visit the Meetings section of our website.